Deb's Cup of Tea: I just couldn't do it. I had to go back to this job today. We have a couple of instruments at a very large public works project. Last Friday, I was there because it had been two weeks since installation with nary a word from the client. Both of the machines had lost power, which means they will get low on internal battery power and turn themselves off. If you are collecting data, this is not a good thing. One of the instruments had been pulled from the job by a well-meaning employee who marched into the supervisor's office, instrument in hand, saying, "We found this and don't know what it is." In neither case were we notified to come out and check the machines or set them up again. We kind of wondered, if I hadn't said anything, would they have let us know? Oh well, they are paying to rent the equipment and we'll bill them. They know the stuff has to be on power. So we reestablished power on Friday and I came back today to get the data out of them. Both of them are in the "basement", if such can be termed that, if this huge facility. From where I stood to where these are, it's a two-story difference. No, there are no elevators or stairs. It means I have to climb down ladders. You all know I have acrophobia, the fear of heights. I will, if absolutely necessary, force that fear into my boots. I had to when I installed these machines. Safety is paramount on these jobs and they had constructed a couple of ladders that, once I got onto the rungs and started down, made me feel reasonably safe. They take long boards of differing lengths and bolt them together with the rungs. These are, in turn, bolted at the top and at the bottom. These hand-made ladders have some give as you're climbing up or down, but they do not move. Although I'm slower than the guys on the construction site when climbing, they waited for me and even held this ladder just because I appeared a bit nervous. I felt even safer when one of the two-story ladders turned out to be a double ladder that was top and bottom bolted. I back onto the top rung and look straight ahead as I climb down. I look up as I climb up. Last Friday, however, the only way to get to one machine was to climb down a two-story metal extension ladder. I watched the guy go down and that thing just bounced and swayed. I took one step onto it and said, "I can't. I'm sorry. This makes me really, really nervous." He just waved and we took care of the machine with me calling down instructions. In servicing the machines today, I climbed down the home-made ladder with no problem. The extension ladder? Forget it. The guy who was with me patted my arm and said, "It's no sin to be scared. Even the safest people can fall." He retrieved my machine and put it back after I had serviced it. 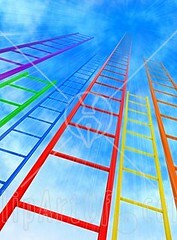 I still feel a bit badly that I couldn't, for the life of me, convince myself to go down the ladder. I could see that it was tied off and anchored, but it was just too high. Generally, we don't climb ladders to begin with because our job is in the basement. This was a very rare occurrance. I'm very glad these guys were understanding. I don't know how I would have managed had I been shown the ladder and told, "Climb down and take care of it. We'll be back in 30 minutes."